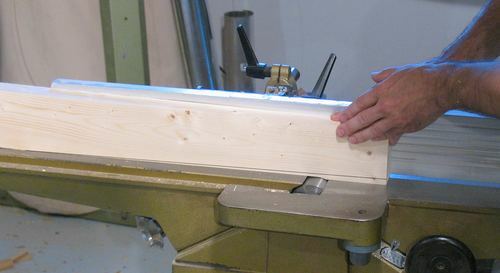 There's many taper jig plans out there for cutting tapers on a table saw. I never bothered to make such a jig myself. Primarily, because I never had a need for one. The thing is, cutting tapers on a jointer is fast an easy. The key is to start the cut part way into the wood. The shot at left shows me about to place the work piece on the jointer. With the jointer running,just set the work piece down on the jointer where the taper starts. With the piece past the head when set down already, it doesn't give the cutter head much material to bite into, so it can't really kick the material, even though its set down on the spinning head. This shot shows nearing completion of the cut. I normally cut thinner pieces off, but made for a thicker cut to make it easier to see in the photograph. For cuts where more than 1 cm of material is removed, its best to rough cut the taper on the bandsaw, and then just clean it up on the jointer. For tapers that go all the way to the end of the piece of wood, just cut a taper that is parallel to the taper that you want, but starting not quite at the end (as in the first photo above). Then, after you have the taper at the right angle, just cut a few more passes to extend the taper to the end.